Welcome to the jungle… – …STILL CRAZY AFTER ALL THESE YEARS! My uncle and his family and everybody who came that day drove all the way from Kuching and like what I used to do before here and also here, they stopped by the little bazaars and towns along the way and by the time they reached Sibu, they had already bought quite a lot of stuff including things that came from our jungle where they grow wild and are sold by some ethnic women at those places, and are not that easily available in the big towns and cities in the state. …to cook for my mum. I’ve cooked a more complicated version here once but my mum prefers it simple so this time around, I did it the way she likes it. My mum does not like it cut too small so that explains the rather big size of the pieces ready to be cooked. 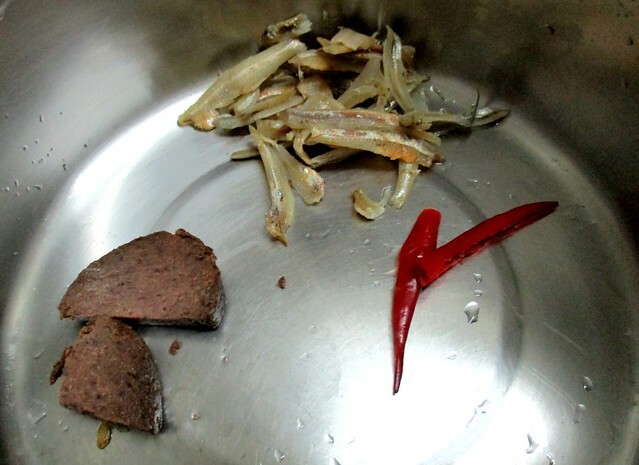 – a bit of belacan (dried prawn paste), a handful of ikan bilis (dried anchovies) and chili. Simmer awhile to let the flavours come out of the ingredients before putting in the durian chunks. …is ready to be served, no added salt and no msg required. …that are actually the kernel of what we call buah pelajo here. Probably that is in Melanau or Sarawak Malay for it appears that some people know them as melinjo or maybe that is in the national language. There are quite a lot of differences between the two, like for instance, we call an aeroplane bilun here but that is a balloon to them and their plane is kapal terbang, literally translated as flying ship. …and wanted to use those instead. …and added a pinch of salt since I did not use a lot of belacan nor did I add any ikan bilis so it would not be salty enough. When everything was almost done, I dropped in the paku (wild jungle fern) and turned off the heat the instant the soup started boiling again. 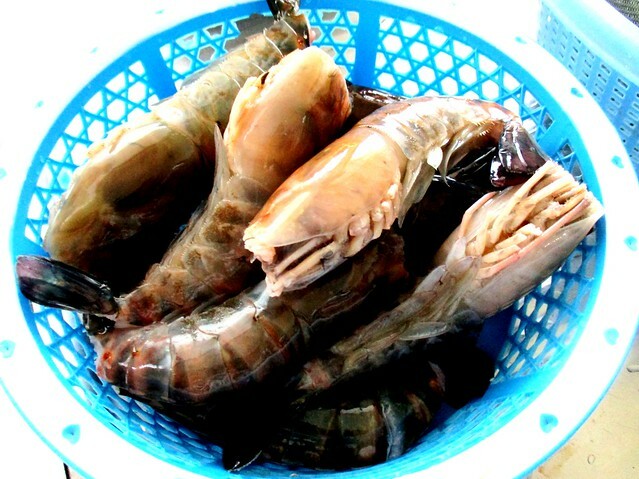 Do not leave the paku to boil in the soup too long as it will become discoloured and will not look nor taste as nice. …and goes absolutely well with rice and yes, it is msg-free. 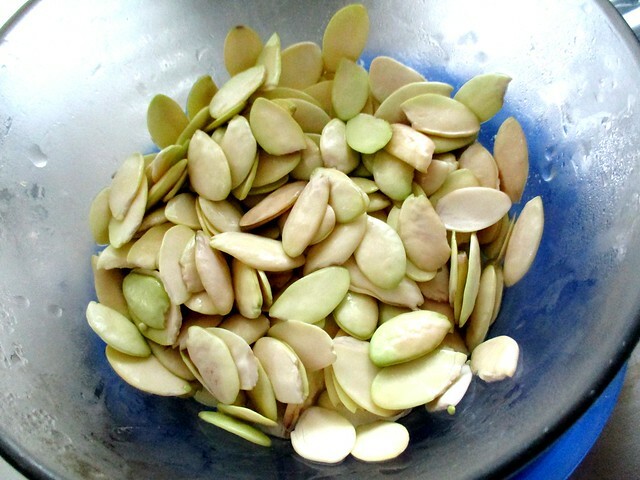 Since it is not easy to get those seeds, we would have to do without those usually but we can cook a lot of other things this same way and it will taste just as great. I hardly use msg anymore in my cooking…but it makes me extra-sensitive to it when I eat out. Current articles, however, seem to claim that it is harmless though but it’s sodium and like salt, it is best to cut down on it – everything in moderation. For one thing, it is expensive so with our frail economy, this is one thing I can save a bit on. 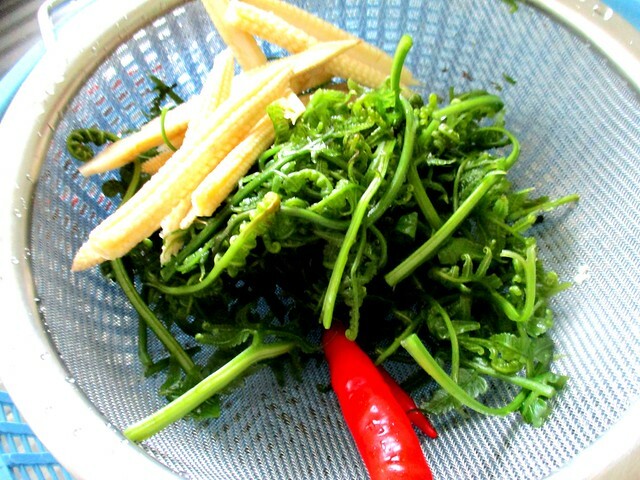 Only with unripe durians…or the fermented ones (tempoyak) with lemon grass added, minus the ikan bilis – I cook my tempoyak prawns this way. I guess people use the ripe ones for cake and desserts and for dodol…and the other day, I saw people eating bubur durian at a Malay shop here – did not try as I only saw it after I had had my lunch, too full already. 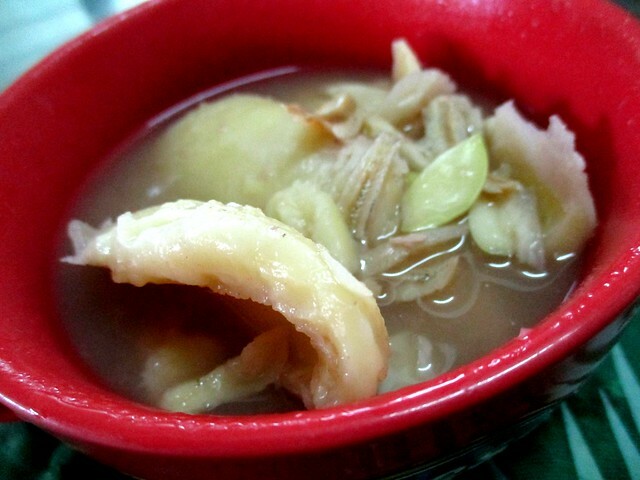 There is also samui, the Melanau way of eating ripe durian tossed with pork lard and sagu’ (sago pellets). Many in my family love this, not me. Lots of the ethnic stuff here that you have never come across…and the Sibu Chinese delights too. No plans to hop over sometime? Very informative post, i’ve never tried unripened durian before but the durian flavor should not be strong and the flesh should not be sweet right? Not as strong nor as sweet as the ripe fruit and the flesh has a nice soft bite to it, not so mushy – the texture is something like breadfruit or tapioca. I wouldn’t have liked it very much if it had been like the ripe ones. Good for you but watch out for it outside. Some places use a lot of it, especially at Chinese restaurants. That is why the after-effects of msg that some people seem to suffer from is known as the Chinese restaurant syndrome. Will have to tell them to cut down or leave it out altogether. What does the durian dish taste like? Do the seeds add any special taste to the 2nd dish in this post? The prawns are big and delicious! So the dish must be very tasty! 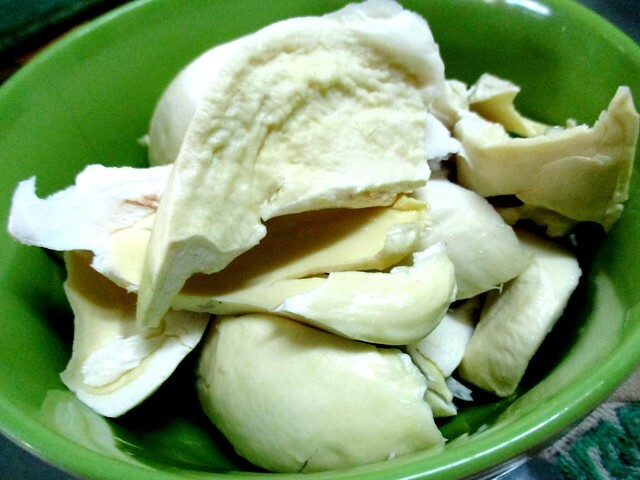 The texture of the unripe durian, after cooking (hard when uncooked) is like boiled tapioca or breadfruit or maybe, a little softer than that but not mushy like ripe durians – add a light hint of durian fragrance and sweetness plus the belacan and the chili. From your description, I can imagine that the durian dish is very tasty! Yum, yum! It is, and so is the other one. We cook that quite often, but not with the seeds though – quite hard to get those in town. 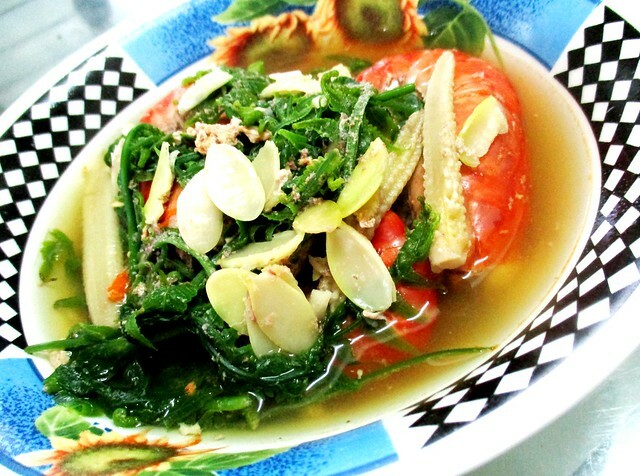 Sayur rebus looks good. I still prefer to eat durian on its own. I’m the opposite. Not a fan of durian – will eat if somebody gives me but will not go out to buy. But I love durian cakes and desserts…and tempoyak and tempoyak dishes such as my tempoyak prawns and this durian mantak rebus is so nice! Different story with the buah pakan/pakon – the yellow/orange wild durian. My missus’ favourite – she will surely buy if she sees any as she enjoys those so much. Very interesting. All this is completely new to me. …and to many other people, I’m sure even those around here. More commonly known among the ethnic groups, the kampung people. I think many town Chinese here would not know of all these as well with a few exceptions, like us. I’ve never had unripe durian like this before. I was in Kapit yesterday and the day before for some work and bought some durians from there. It’s the jungle durian with the orange flesh, very nice, tastes like nangka and there’s not a lot of meat but it’s really good. Surprisingly more expensive than regular durians too. It doesn’t have the strong smell and taste of regular durians so some say it’s better for people who don’t like durians. That’s buak pakon or pakan, the wild durian. We love those – and we would buy to eat, something we would not do when it comes to the regular durians. Yes, the taste and smell is milder and we love the texture of the flesh, not so mushy like the regulars. I guess they are coming out now – seen a few around but they were too expensive. The sellers told me once that they would only come out full swing once the durian season ends. Flying ship, that’s epic, guess is like last time they build the kapal first, but then later on is plane, so just carry forward to kapal terbang. Wow….I Love to try your homecooked dishes above!! 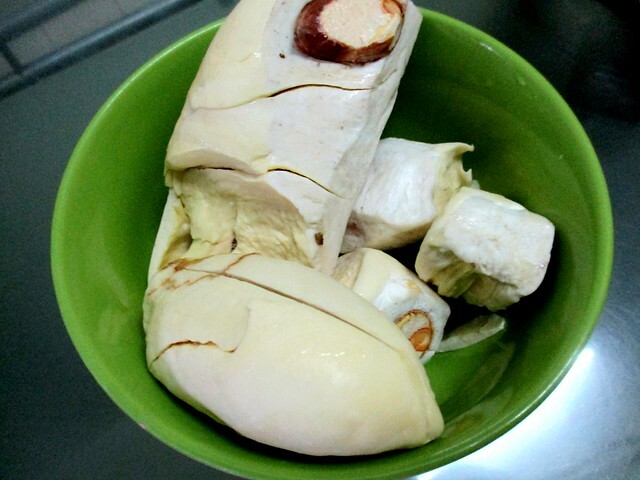 I like your jungle dishes… hahahaha… without msg or heavy flavoured sauce.. that is what I need at my age now… I wonder how the unripe durian taste like with belacan and all…very unique.. ! These two dishes are new to me. Very interesting that unripe durian can be cooked like that and enjoyed. I never knew that! Should you come across any, don’t throw it all away. Give it a try, cook it! I am sure you would love it! That is a very interesting dish. The unripened durian dish. Wonder if I can do the same with the durians here? William’s dad sometimes brings home unripened durians from his orchard. We usually just disposed it off. Such a waste. Have never eaten durian mentah before. It must be delicious. Give it a try! I love it! Pingback: This time last year… – …STILL CRAZY AFTER ALL THESE YEARS! Pingback: Once a year… – …STILL CRAZY AFTER ALL THESE YEARS! Pingback: Not so easy… – …STILL CRAZY AFTER ALL THESE YEARS! Pingback: Remembering… – …STILL CRAZY AFTER ALL THESE YEARS!